Seth Rogen typically plays the relatable, everyman, slacker in his films like Knocked Up, Pineapple Express and The Interview. But in Steve Jobs, coming to theaters this October, he’ll play one of the masterminds of the computer industry — Steve Wozniak. Can he pull off the brainy role. Time will tell. In the meantime, here are some fun facts about the actor that you might not know. Rogen grew up in Vancouver, BC. He dropped out of school as a teenager to try his hand at comedy and landed a gig with a troupe. His first gig, at age 13, was at a lesbian club in Vancouver, which he thought was just a Ladies' Night at a local bar. By 16 he had won second place in the Vancouver Amateur Comedy Contest. He performed around BC and then moved to Los Angeles to give the big time a shot at places like the Improv and the Comedy Store. His name spread as the young funny kid and Judd Apatow (Bridesmaids, Trainwreck) asked him to audition for his new TV series Freaks and Geeks. At 16 he landed the part and became a regular on a primetime TV series. It lasted only one season, but put Rogen on the map, along with some of his co-stars James Franco and Jason Segel. And Apatow and Rogen went on to work together on many films including Anchorman, The 40-Year-Old Virgin and Knocked Up. Apatow wanted Rogen to star in his next film Undeclared but using an unknown who was not your typical leading man material, did not fly with the powers that be at Fox. So instead Rogen played a small part and became a staff writer at the age of 18. Apatow mentored Rogen in writing and the actor soon landed a job working on the final season of Da Ali G Show starring Sacha Baron-Cohen. The staff was nominated for an Emmy that season. They did not win, but Rogen's status in comedy was cemented. 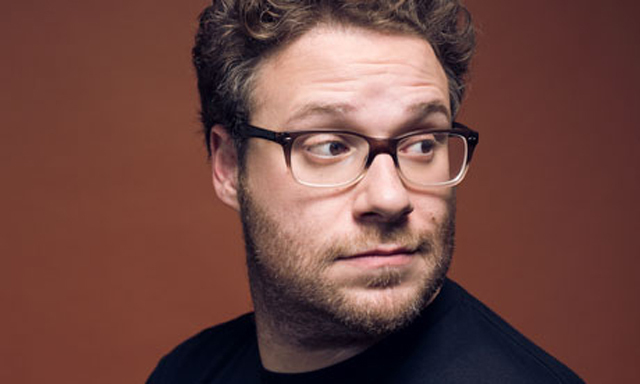 While Rogen is known as the lovable, slacker on screen, his voice might be even more popular than his face. In 2007 he began his voice over career playing the Ship Captain in the animated feature film Shrek the Third. He followed that with Morton the mouse in Horton Hears a Who, Hogsqueal in Spiderwick Chronicles, Mantis in Kung Fu Panda, B.O.B in Monsters vs. Aliens and Paul the alien in Paul. Steve Jobs opens in theaters on October 19 and co-stars Michael Fassbender in the title role.